In detail ... the SL 38 classic (left), the SL 38 Ferro (centre) and the SL 38 Cubic (right). Reynaers Aluminium’s relaunched window system is slimmer, more energy efficient and well suited for modern day architecture. 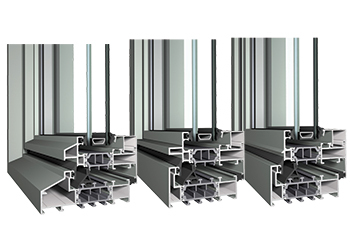 Reynaers has relaunched its Slim Line 38 series aluminium window system, which now boasts ultra slim profiles with improved energy efficiency. The highly insulated Slim Line 38, comprising SL 38 and SL 38-HI, has a ‘steel look’ and is ideal for modern architecture, says the company, a leading European provider of innovative and sustainable architectural aluminium solutions. “The new system, which succeeds CS 38-SL, is available in three design variants (Classic, Cubic and Ferro) and is perfectly suited for new buildings, where the unique slim lines allow for an abundance of light,” says Ali Khalaf, the managing director of Reynaers Middle East, who brought the brand to the region. Reynaers Middle East is the regional office of the Belgium-based Reynaers Aluminium.. The new system is also perfectly suited for the retention of existing structures, for example an older conservatory, allowing users to preserve the vintage appearance, or for renovation projects where steel frames have to be replaced, he says. The profiles’ appearance give a strong industrial and minimalistic architectural appeal to buildings. The Slim Line 38 series feature a highly insulated three-chamber system with ultra-slim profiles for increased thermal characteristics. The solution is available in fixed, turn, and turn-tilt variations with Uf values down to 2.3 W/sq m K (1.9 W/sq m K for the HI version). Hi-Finity ... sliding door with an infinite view. The system is suitable for both double and triple glazing without losing the minimalistic look. All windows and window-doors are available with hidden hinges to further add to the system’s excellent design, Reynaers says. In combination with its superior insulation capabilities, the system provides the perfect harmony between durable material, timeless design and demanding architectural challenges. 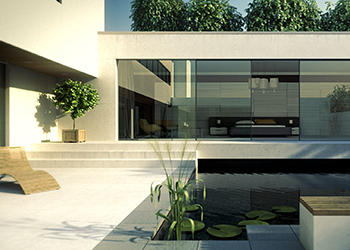 Headquartered in Belgium, Reynaers’ product range includes a wide variety of window and door systems, curtain walling, sliding systems, sun screening, conservatories, skylights, screens and systems to incorporate blinds and ventilation grids. The company was established in 1965 and has offices in more than 30 countries worldwide. Reynaers Middle East is part of Reynaers Aluminium and has its headquarters in Bahrain. This year it celebrated its 10th anniversary and has journeyed from being a relatively unknown brand in the Gulf to becoming an acknowledged industry leader with a strong presence across the Middle East and North Africa (Mena) region. Reynaers systems have been installed at notable projects in the GCC, Egypt, Lebanon and Jordan. Over the past years, Reynaers Middle East has introduced several systems to the region including the concept folding CF 68 and CF 77, Hi Finity (the sliding door with an infinite view), Sensity (the aluwood variant) and the luxury handle called Purity. Most of these systems have gained ground in the market for their unique features and performance, according to Khalaf. “However, our top-selling system in the projects business remains the curtain-walling solutions since the Middle East is a market of high-rise towers and commercial buildings. Additionally, several of the windows, doors and sliding systems like ES 50, CS 77, CS 59-Pa, CP 50, CP 130, CP 155 are all in high demand in the region,” says Khalaf. The company aims to diversify its Middle East portfolio through a new business model catering to the highly potential residential sector in the region.